Harrison County State Forest is a quiet, little forest in eastern Ohio near the West Virginia panhandle. It was created in the late 20th century as a reforestation effort of former coal strip-mining areas and seemed like a perfect place to visit for our first foray into boondocking. From the areas of the forest that we explored, I think it is safe to say that their effort - which involved planting over 100,000 trees on 186 acres - was a huge success. The forest seems to be a place of endless trees, underbrush and bird songs. We stayed at the Ronsheim campground, which consists of seven rustic campsites on a loop off of the forest road. The sites each consisted of a paved parking pad roughly 30’ long, picnic table, and fire ring as well as vault toilets, garbage cans, and a non-potable water well for shared use. With such an adorable campground in perfectly peaceful woods we weren’t sure if we would get a spot arriving late on a Friday afternoon. But boy were we wrong! We arrived at an empty campsite and other than a small family of tent campers arriving after us for Friday night, we were all alone. The lack of other campers seemed even more strange once we took the short hike down to the small earthen dam, which can only be described as a fisherman’s paradise. But nonetheless, we thoroughly enjoyed our private experience and the symphony of bird songs that surrounded us in the hills of the Ohio River Valley - especially one very curious cardinal that seemed intent on demonstrating its aerial acrobatics to us at every opportunity. The encore to the day's performances came in the form of the most spectacular firefly encounters that we have ever seen. Hundreds of the bio-luminescent beetles lit up the darkness all around our campsite in an almost unearthly display. 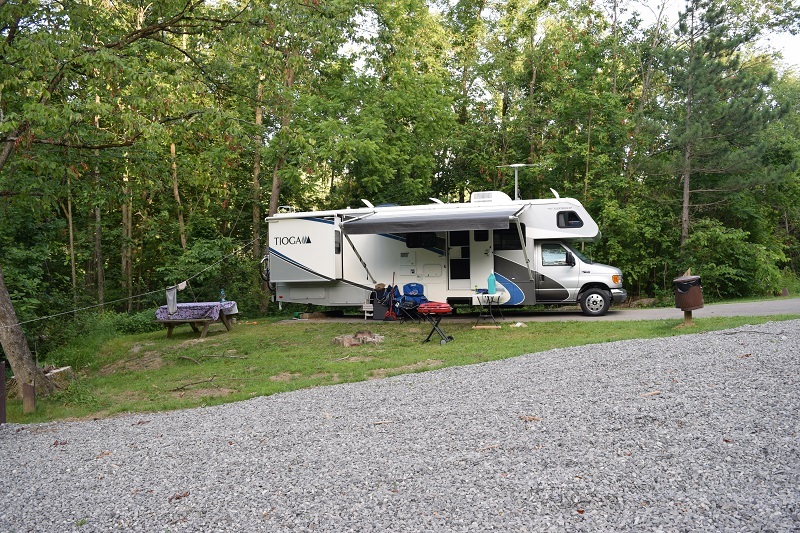 In the end, we were looking for a quiet first weekend of boondocking in peaceful forest and that is exactly what we found at the Ronsheim campground of Harrison County State Forest. Reservations: None taken. Self-Registration required and consists of filling out a form that can be found at the vault toilet building and placing in your vehicle window. Sites: 7 sites with paved parking pads ~30-40 feet, some fairly level others not suitable for non self leveling campers. Each has a picnic table and fire ring. Amenities: Non-potable water well, vault toilets, garbage cans, waste water dump drains (GREY WATER ONLY), 100 yd. shooting range nearby (not close enough to be a nuisance to campers), hiking/horse trails, fishing. Other Notes: There is also the Trailriders Campground within the State Forest which has 20 campsites. Although we did not make it over there it is our understanding that these sites are set up much the same way as the Ronsheim Campground with the addition of a horse hitching post.